Brewers have long appreciated the value of hops from the Pacific northwest, but it was Cascade, a variety practically synonymous with craft brewing, that made the area more generally famous among beer drinkers. Cascade was named for the Cascade Range, which runs down the west coast of North America. The home of the Cascade hop is the Willamette valley, roughly halfway between the mountains and the coast. Cascade was released in 1972, but the history of hops in the Willamette valley goes back to the 1830s. The industry has seen more than its fair share of ups and downs, all examined by historian Peter Kopp in his book Hoptopia. The whole question of changing tastes in beer, and how that affects the fortunes of different hops, is fascinating. If you’ve been a listener forever, you may remember a very early Eat This Podcast, about the rediscovery of an English hop known prosaically as OZ97a. Deemed too hoppy and abandoned when first tried, the vogue for craft beers resurrected its fortunes. It’s a fun story, though I say so myself. Peter Kopp’s book is Hoptopia: A World of Agriculture and Beer in Oregon’s Willamette Valley. 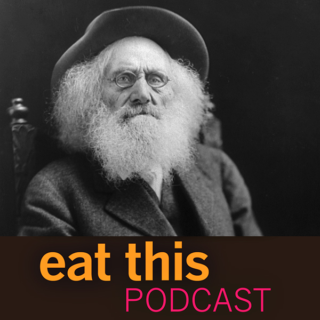 Cover photo is Ezra Meeker, the early grower of hops in the Willamette valley who pioneered the global marketing of Oregon hops. The booming hop business made him the territory’s first millionnaire, and perhaps also its biggest bust. Hop King: Ezra Meeker’s Boom Years chronicles that part of his long, rich life. Banner photo of hops by Paul on Flickr. So when was it that Guinness sourced its hops from Oregon? Any idea on volumes? Guinness seems to have started using some American hops, sourced from English merchants, as early as the 1870s. In 1906, soon after Horst’s first delivery of hops from Oregon and Washington, the total American hops was 39,778 zentners, while English hops provided 33,425 zentners. I guess these are standard zentners of 50kg. Thanks to Peter Kopp for sharing some of his references, especially Guinness and Hops by J.F. Brown (1980). Peter Kopp liked this article on facebook.com. [email protected] liked this article on twitter.com. [email protected] mentioned this article on twitter.com. Kate Marshall reposted this article on twitter.com. creanzaoliveoil liked this article on instagram.com. mydnyghtrose liked this article on instagram.com. labnoon liked this article on instagram.com. slagravinese liked this article on instagram.com. tracebridge liked this article on instagram.com. lmcreamer liked this article on instagram.com. UC Press liked this article on twitter.com. UC Press mentioned this article on twitter.com. UCP Food & Wine liked this article on twitter.com. Ann Brandon liked this article on facebook.com. Stephen Wooten liked this article on facebook.com. A hop crop flop in Europe made the fortunes of growers in the Pacific north west of America, none more so than in Oregon's Willamette valley. Ezra Meeker, the hop king, promoted the gemütlichkeit of hop-picking in the old country as the frontispiece to his book; the reality was somewhat different.